Day 192 / Hat 192: Gold-colored plastic hat in the shape of a Thai chada (ชฎา). Generously loaned to the Project by one Ms. Margaret Waldock. It took me a few minutes of searching the interwebs (using the phrase "pointy Thai hat") to come up with the name and back story on this type of hat which knew I'd seen before. Based on a piece I found in the Bangkok Post, it is a largely ceremonial piece of headgear that can be traced to dancers performing in an ancient mask performance called khon in the royal court in the early Ayutthaya era (Ayutthaya was, I discovered with a wee bit more searching, a Siamese kingdom that existed from 1351 to 1767). 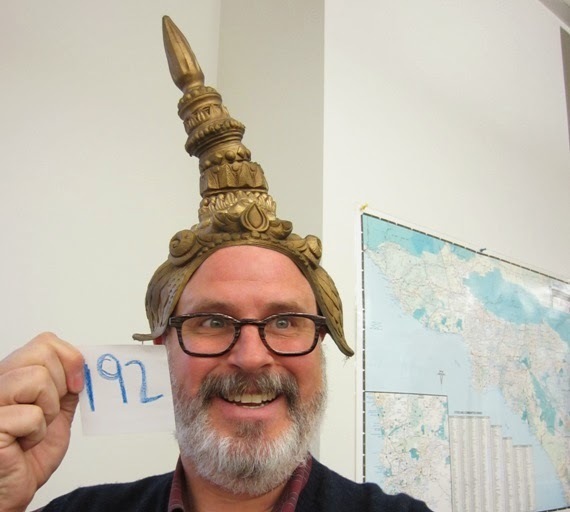 According to the Post, "It eventually became the headwear of Siamese ambassadors to Europe during King Narai's reign." In the same article, Pachat Tiptus, senior exhibition coordinator at Museum Siam is quoted as questioning whether the chada is actually "truly Thai." Another piece of Thai trivia? Apparently the 14th letter of the Thai alphabet, daw chada (ฎ) is named after this headdress. Today's earnest hat tip goes to Margaret Waldock - thanks for the loan of the leaning learning lid!